Sliding down the damp late afternoon spring snow to the base of the Grand Montets, we saw Killian Jornet and Mathéo Jacquemoud skinning up the piste with their distinctive rolling, long poling techniques. No doubt they were off for a short training session to the summit of the pistes 2000m above, probably a steady 1hr30 for them. No surprises there, except they had been racing that morning in Switzerland! It seems there is no magic bullet to training except to start young and put the hours in. These two put in around 20,000 metres vertical training per week and their performance shows: they continually hit the podium of nearly every race they enter. Most of our bodies aren’t in a condition to sustain that kind of training. 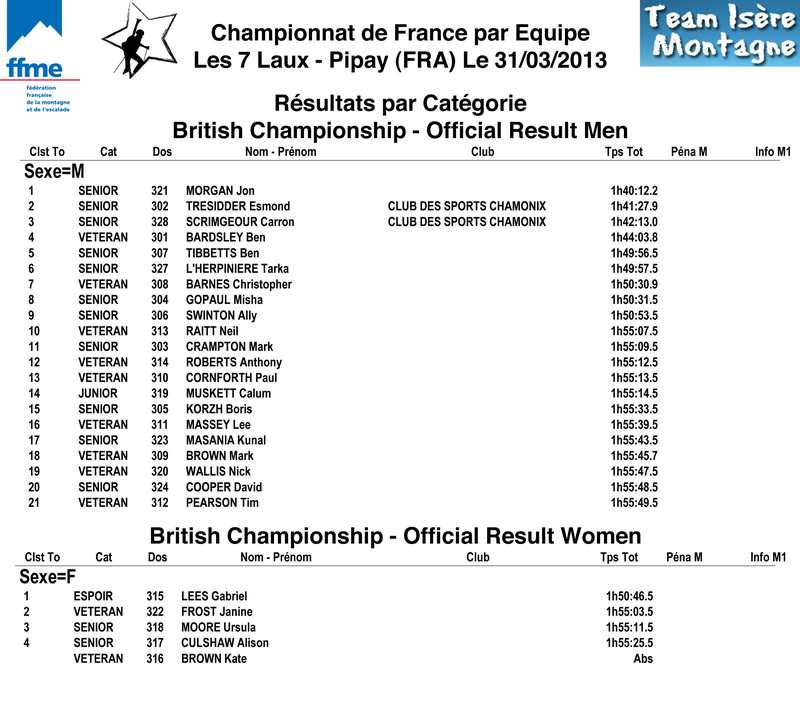 This year the British Championships were held at La Belle Etoile – Sept Laux station in France over the Easter weekend and saw a huge range of experience from first time racers like Callum Muskett and Ally Swinton, to gnarled Veterans such as Ben Bardsley and Jon Morgan. In the week of preparation before the Champs a group of us got out for a last training tour up Le Génépi above Martigny (CH). Callum had very little touring experience and has only learned to ski on snow this season. However his enthusiasm and evident fitness made up for any shortfalls in technique! Génépi is a somewhat elusive peak, hidden back beyond the more popular peak of Pointe Ronde, and requiring a significant climb of 1600m from the parking at La Poya. By the time we broke trail up onto the plateaus of Chaux de Bovine it was cooking and we were all reduced to t-shirts. Jon and I were taking it easy on race kit, Misha, Ben B and Callum were on heavier touring kit, of which Callum’s was farily vintage. It all seemed to be working fine for him, though one of his skis was a little warped and suspect. Though a fairly modest peak at 2884m, standing out at the NW edge of the range it develops great views as one gains the higher slopes and finally the ridgeline round to the summit. 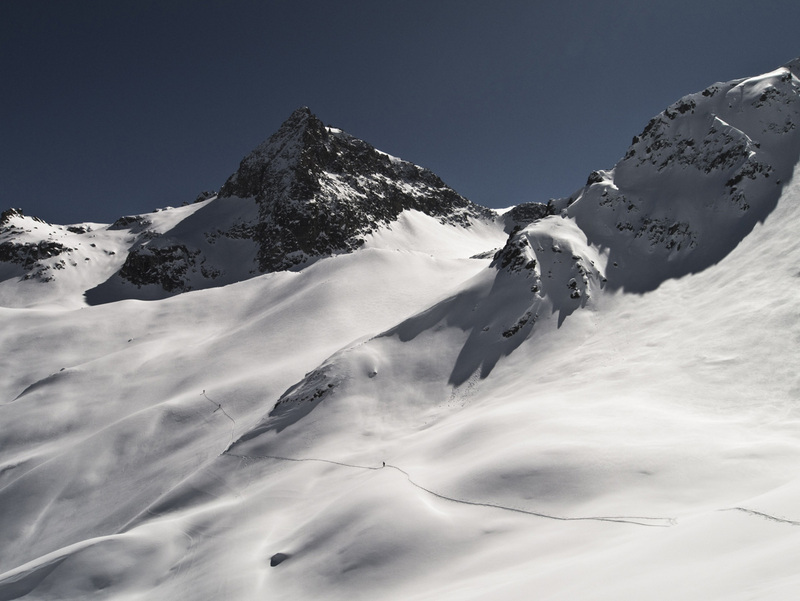 Moreover as access is more arduous than nearby objectives it often remains untracked, and the north facing couloirs hold great cold snow long after a snowfall. I dropped into the couloir between the two summits rather tentatively on the skinny skis, the others followed down the smooth and consistent couloir, except Jon who quested up and over the other side of the summit to find the steeper entrance of the NE couloir. 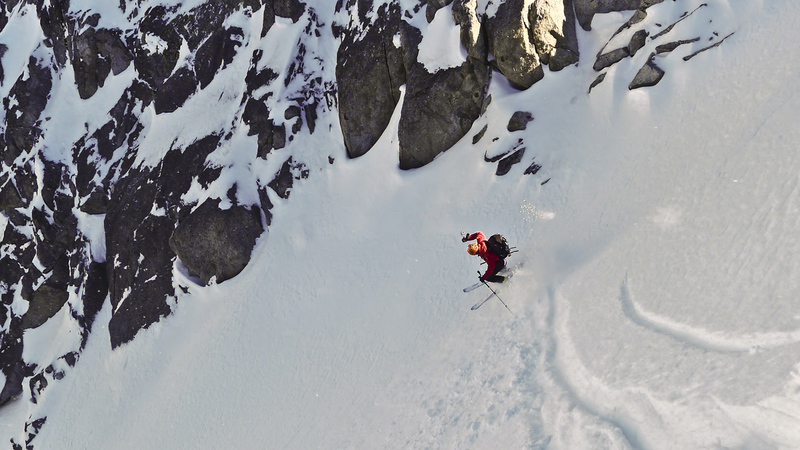 Callum’s ability to run a long 45° couloir on only a week of skiing is just an indicator of the talent he has in store, yet more remarkable was his ability to ski telemark for the remaining 1000m of descent once his ski snapped! The wood core was soft and rotten. The course set for the British Championships looked ambitious and exciting: plenty of up and down across the Dent du Pra and Pic de la Belle Etoile to spread the field out, several portage sections, and an airy ridge traverse on crampons. For those that haven’t had the good fortune to try SkiMo race kit, it performs surprisingly well. 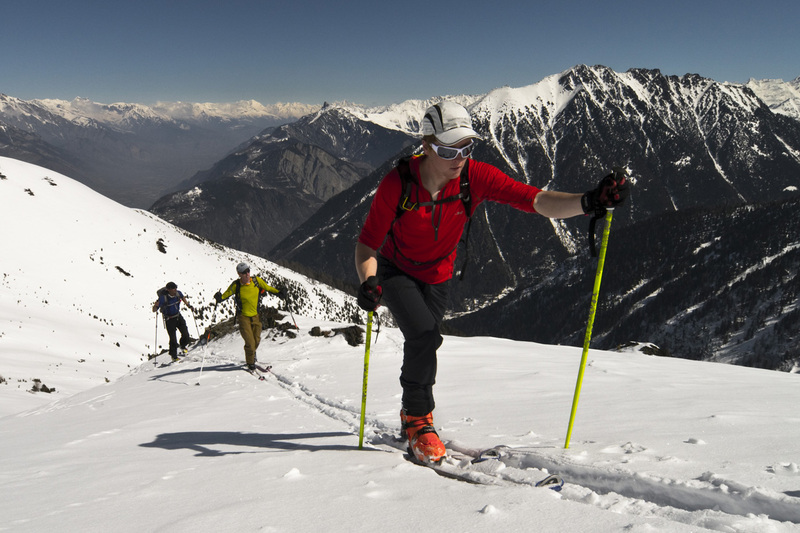 The skis, from a mere 700g per foot, 160cm long for mens and 150cm for women, are far from the noodley matchsticks they appear to be, and with a light pack and boots they respond well to a certain aggressive fall line approach. With this in mind the rugged terrain and steep descents of the course were going to be a great relief from the purgatory of threading fast kick turns uphill on ones cardio limit. A group of 10 of us organised a chalet to stay in nearby for the weekend and several of the team arrived a day early to help the course organisers put the track in. 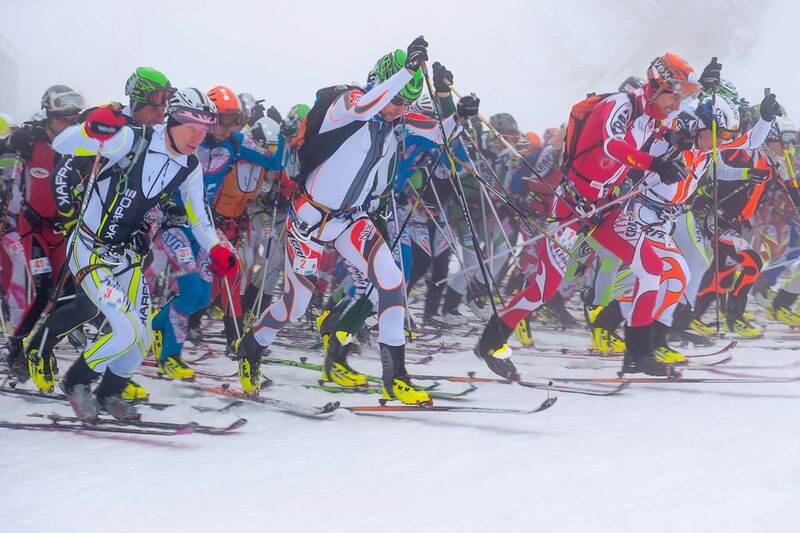 The longest race served as the stage for the French national team championships, another course was set for beginners, and ours was an individual race. The weather and snow conditions in the day before the race put paid to the original course design. The 0° isotherm rocketed above the summits the snowpack wetted out and avalanches broke off across the massif. I remember falling asleep hoping that they might be able to salvage something from the conditions. When I awoke in the night to torrential rain outside I was lulled back to sleep safe in the knowledge that they couldn’t possibly run the race – the stress was over for this weekend. Incredibly at this time, 3am, there was a team of guides and other avalanche professionals out blasting, tracking and flagging a course in zero visibility and significant fresh snowfall. When we got up in the morning the snowline had dropped considerably, and up at the start line it was cool and claggy, the cloud base hanging just a couple of hundred metres above the station. The start of these events is typically brutal as courses narrow to one or two set skin tracks after a few hundred metres. Where one ends up in the pack after the initial sprint strongly determines where one will remain for much of the race. Fast transitions and fall line descents are the most efficient ways to gain time and places thereafter as trying to pass folk to the sides of the track is exhausting. I set off well in the middle of the pack, with several of the other Brits visible around me amongst a sea of other French and international athletes. I tried at the start to pace myself against the contending British guys – Es Tresidder, Jon Morgan, Ben Bardsley and Carron Scrimgeour. My heart rate went through the roof, hypoxic dizziness clouded my vision and after a few hundred metres I had to ease off the gas a bit. On the first climb I tried a rather desperate overtaking manoeuvre on the outside of a kick turn as the guy ahead was moving slightly slower than I wanted to and was losing the bunch ahead. However as I pedalled past in the deep snow his pole accidently hammered down on my front release and I was face down, ski off, eating snow. Losing several places I was a little frustrated, but this served well to fire me up the rest of the climb. The first transition was on a breezy ridgeline, visibility was about 80 metres and the markers were only about that far apart, snap, rip, clack – boot done up, skin off, binding set. Throwing myself down the slope I struggled to keep up behind some fast French folk – without them it was flat white all around so it was essential to keep on the tail of someone willing to fly into the void. My goggles steamed up and were quickly useless and so the snow falling was stinging my eyes. One poor guy was standing by a small unmarked rock with a broken ski. The next couple of climbs went by in a blur, cold hands, overheating body, energy gels hoovered up. I had long since lost contact with the front of the race, nor had any idea where I was on the terrain or in the field of competitors! I just gave what I could, whilst leaving enough for the last big climb… then in a rush of confusion the race was ended early on the top of a windy col as the vis had reduced to near zero. The organisers were trying to scribble down numbers and times, but as more and more competitors piled up onto the top it seems a miracle they produced any results at all. It was chaotic, but the suffering was over, which was both relieving and a bit disappointing as I think many of us were getting well into the flow at 2/3 through the envisaged course. At the head of the British field the top 4 places were very strongly fought with great uncertainty to the very end. Jon Morgan gained first place at 1h40:12, Es second, Carron third and Ben Bardsley fourth. The women’s was equally strongly fought, initially close on the climbs, yet soon Gabriel’s strong descent technique gained her a gap at the front of the field. Well done to everyone who took part, especially Ally and Callum for whom it was their first SkiMo race! At only 10-15% off the head of the British pack the next few years could see these guys shake up the scene! To put things back into perspective Jon was less than 11 minutes off Matéo Jacquemoud (the current world ranking no.2) at 1hr29:46. Incredible considering all the top French athletes are professionals. Maybe we could start to justify backing our upcoming young athletes with the coaching and support available to continentals? 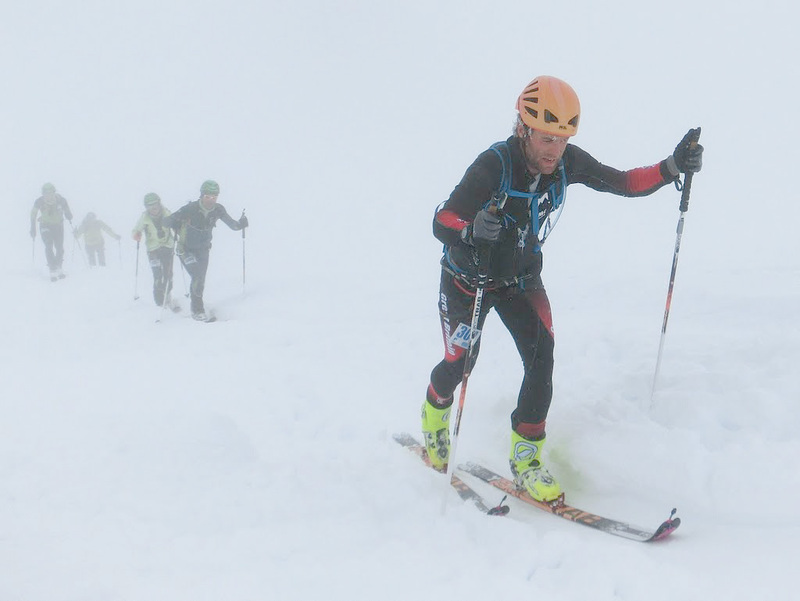 British Ski Mountaineering is supported by the BMC. The British team are supported by Rab.